Please read this post about the Japan Earthquake and Tsunami and consider supporting the cause! The Canon EOS 7D was announced by Canon at the end of August 2009. It is a brand new camera filling a gap in the Canon DSLR lineup that has no predecessor before. Canon has made APS-C sensors DSLR for as long as any other camera makers and although they have done well in the past with their previous top of the line APS-C DSLR like the 50D, they did not have any “pro” class APS-C DSLR that directly answered to competition from Nikon D300 and the recently released D300s. Those who have read my previous reviews would know my review style. This will be the same type of review and is not meant to be a comprehensive technical review like those you see in dpreview.com. I will mainly concentrate on the the new features and improvement as compared to previous EOS cameras like the 50D and 5D Mark II. Both of which will be the main reference for comparison. I hope this review will help those thinking of buying the EOS 7D and to see whether it maybe a worthwhile upgrade or a good companion to your present camera. Canon has quite clearly emphasized that the 7D has a newly designed body that is different from previous generation cameras like the 50D or 5D Mark II. Although, the 7D body is unmistakably a Canon EOS body, there are subtle design changes different from previous Canon DSLR. It is also the first Canon DSLR other than the 1D and 1Ds series that has full environmental seals. Canon claimed that it is equivalent to the EOS–1N. I will first compare the 7D to the 50D.You can click on the individual images for a larger view. If we first look at the front of the cameras, you will notice that the 7D body is slightly more “rounded” than the 50D. The prism bulge at the top is also appreciably larger on the 7D. On the front surface of the grip on the left side of the 7D, you can see the infrared sensor for Canon infra remote shutter release. You can also see a few small holes on near the top on the right side of the 7D, those are the opening for the microphone. If we now look at the back of the cameras, you can see there are quite a few differences between the 7D and the 50D. The power switch on the 7D is now a separate switch on the top left side, just behind the Mode dial. At the position of where the power switch was on the 50D, it is now replaced by a simple switch that only performs a “locking” function for the Quick Control Dial. Most of the buttons on the 7D are located on the left side of the LCD display instead of on the button as on the 50D. For the first time on a Canon EOS camera, the markings for the buttons are actually on the buttons themselves rather than besides the buttons. There is also new button/switch on the right side of the viewfinder eye-cup, it is a dedicated button/switch for starting Live View or movie shooting. The Print button now also function as a “One Touch” RAW+JPEG” button. Another new button is the Quick Control button marked “Q” on the top left hand corner, pressing this button lead you straight to the Quick Control Menu. You can also see that the eye-cup on the 7D is actually different from the one on the 50D. The 7D uses the same eye-cup as 1D and 1Ds series, rather than sharing the eye-cup with the xxD or 5D series. Perhaps a subliminal message from Canon that the 7D has a professional grade body similar to the 1D and 1Ds series? If we know look at the top of the cameras, you can see more changes. The shape of the prism bulge is appreciably more rounded than on the 7D. The mode dial on the 7D is black instead of silver in color, and it does not have all the numerous auto modes on the 50D such as portrait, landscape and sports auto mode. Both the 7D has 3 Camera User Settings C1, C2 and C3, 50D only has 2. There is also new Multi Function button marked M-Fn left of and behind the shutter release button. We now look at the bottom of the cameras. The main change I want to highlight is the battery door, you can clearly see that it is spring loaded on the 7D. If you open the battery door on the 7D, it will stay open at the maximum position and will not swing around, unlike on the 50D battery door, which is not spring loaded. Although it is hard to see and not noticeable on a photo, the CF door on the 7D is of much sturdier construction and is also spring loaded like the battery door. The CF door fits perfectly after closing and has no play whatsoever. I will now compare the 7D body to the 5D Mark II. We will first look at the front of the cameras.The 7D and 5D Mark II are quite similar in size, but the 5D Mark II being a full frame camera, has a even bigger prism bulge (extending upwards) than the 7D. The infrared sensors and microphone openings are situated at different positions on the 2 cameras. We now look at the back of the cameras. The buttons layout on the 7D are similar to the 5D Mark II with most buttons on the left side of the LCD display. The 5D Mark II lacks some of the new buttons on the 7D like the Quick Control button and the dedicated button/switch for Live View/Movie mode. The 5D Mark II shares the same “old style” power switch like on the 50D. If we now look at the top of the cameras, the 7D prism housing bugles forward a lot more than on the 5D Mark II because of the built in flash. The mode dial and available settings on the 7D is identical to the one on 5D Mark II. The EOS 7D has a new BG-E7 grip. It is similar in construction to the BG-E6 grip for the 5D Mark II, which is made of metal rather than plastic of the BG-E2N grip for 50D. It also has an AF-ON button on the grip and also a Multi Function button (M-Fn). You can see how the grips look on the 7D compared to the 5D Mark II below. It is interesting to note that the new BG-E7 grip does not have any lettering in front, no Canon log or model name at all, unlike other Canon battery grips like the BG-E6 and BG-E2N. Another interesting observation is that, the BG-E7 grip is clearly marked “Made in Taiwan” rather than “Made in Japan” compared to previous Canon battery grips. The EOS 7D is the second Canon EOS camera to use the new LP-E6 battery. It is an intelligent battery unlike the previous BP511A used in 50D. The camera can more accurately display remaining battery level in percentage with shutter count and recharge performance too. The new LCD display is supposed to be even better than the one on 50D and 5D Mark II. It has the same VGA resolution. I can report that it is bright and clear and good for checking focus. The brightness of the LCD display can be either set manually or automatically according to ambient light level. The auto brightness function works very well indeed. Previous Canon EOS DSLR only offer +/- 2 stops of exposure compensation. The 7D is the first Canon EOS DSLR to offer +/- 5 stops of exposure compensation. However, as can be seen on the image below, the top LCD display only shows +/-3 stops of exposure compensation. To see full +/-5 stops of exposure compensation, you will need to go into the Expo comp./AEB setting menu. It would be more convenient if Canon were to display the full +/- 5 stops on the top LCD. However, it can be argued that most users probably don’t need to set more than +/-3 stops in general usage. The 7D menu laid out is similar to the 50D and 5D Mark II. If you are a 50D or 5D Mark II user, you should feel right at home. There are some extra items in the 7D menu not found on the 50D on 5D mark II, mostly relating to autofocus settings. Just like the 50D and 5D Mark II, you can set jpeg and RAW quality independently. Interestingly, Canon changed the small RAW nomenclature from sRAW1 and sRAW2 to MRAW and SRAW on the 7D. The One Touch RAW+JPEG button (shared with the Direct Print button) is a new feature on EOS camera. If the current recording is JPEG or RAW only, you can change it to RAW+JPEG immediately by pressing the One Touch RAW+JPEG button. The RAW and JPEG image quality can be preset in the One Touch RAW+JPEG menu. The INFO button can be set to display camera settings, electronic level or shooting functions. You can see what the Electronic level looks like below. The Shooting function info allows you to see different settings on the camera all on one screen. You can set copyright information directly in-camera. You can enter the author’s name and copyright details which will be added directly to the exif data on all RAW and JPEG files. There is a dedicated menu for both built in and external flash function settings. The 7D offers different flash modes and is also the first EOS camera to offer control of multiple flashes directly from the camera. 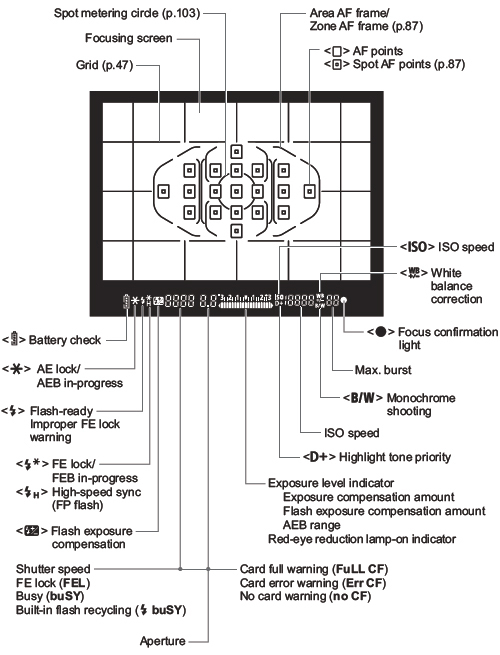 Flash modes for in-camera flash include ETTL-II, Manual flash and MULTI flash. Flash modes for external flash include ETTL-II, Manual flash, MULTI flash, TTL, Auto external flash and Manual external flash. You can simulate framing for different format like 6:6, 3:4, 4:5 etc on the 7D. During Live View shooting, vertical lines corresponding to the aspect ratio will be displayed for framing reference. The image recorded will still be 2:3, but aspect ratio information will be appended automatically to the captured file, so when displayed with Canon’s Digital Photo Professional, the image will be displayed with previously specified aspect ratio. Of course this function will not work with 3rd party RAW processor. Unlike the 50D or 5D Mark II, the 7D focusing screen is fixed and not interchangeable. However, because of the transmissive LCD incorporated in the viewfinder, the 7D can display a grid in the viewfinder without having to change to another focusing screen. The grid display can be turned on & off in the custom menu. The 7D has a function which will allow the user to set custom function for different buttons and wheels on the camera body. For example half pressing the shutter release button can be set to Metering and AF start, Metering start or AE lock. The EOS 7D no only has an all new improved autofocus system, it also has many different autofocus custom functions. I will go through the different custom functions below. However, there are too many different settings and I will not go into all of them in details. I will only try to explain what some of those customs functions do. For full explanation of the different custom functions, you can download a copy of the EOS 7D manual from Canon web-site. The AF sensitivity for tracking subjects or obstacles moving into AF points can be set to one of five levels. If set towards slow, interruptions by any obstacles will be less disruptive. If set towards fast, it will be easier to focus any subjects which suddenly enters the picture from the side. Basically this custom setting allow you to alter the servo’s operation characteristics and shutter release timing. For example if you set custom setting 0, you can set it so that for the first shoot, focusing is given priority over shutter release. For subsequent shots during continuous shooting, focus tracking is given priority. What that means is that you are setting the camera up so that you will more likely to get the first and subsequent shots in focus, while sacrificing your speed of getting the first shot and continuous shooting speed. You may get more shots in focus, but less total number of shots and you may miss some special moments. Another example is that if you set custom setting 2, you can set it so that shutter release is given priority over focusing for the first shot. For 2nd and subsequent shots during continuous shooting, continuous shooting speed is given priority. What that means is that you will get the first shot faster and get more total number of shots. You will be less likely to miss certain moments, but less of the shots maybe in focus. What this custom function does is that, while you are focus tracking a subject in AI servo mode, the camera can either be set to continue focusing the target subject even if a closer subject suddenly appears in the picture, or the camera can switch to focus the closer subject. If autofocus is executed, but focus cannot be achieved, the camera can be set to keep trying to focus or stop. The EOS 7D has a new AF system with 19 cross-type AF points. There are various way which you can select AF area within the 19 focus points. 1. Single-point AF – allows you to manually select any single AF point to focus. 2. Zone AF – the 18 AF points are divided into five zones which can be manually selected for focusing. 3. Auto select 19-point AF – all 19 AF points are used to focus. 4. Spot AF – similar to single-point AF, but the selected AF point covers a smaller pinpoint area to focus. 5. AF point expansion – the manually selected AF point and adjacent AF points are used to focus. Effective when it is difficult to track a moving subject with just one AF point. You can select which modes to be available for use in the custom menu. This custom function allows you to change the behavior of manual AF point selection pattern. During manual AF point selection, the selection can either stop at the outer edge or it can go on to the opposite AF point. The AF points and grid in the viewfinder can be illuminated in red. This custom function allows to to set when illumination should come on. The AF area selection mode and manually selected AF point can be set separately for vertical and horizontal orientations. This function can be turned on in the custom menu. Just like on 50D and 5D Mark II, the 7D has AF Microadjustment that allows you to make AF adjustment if necessary for up to 20 lenses. Unfortunately, Canon is still refusing to make turning on/off mirror lockup a simple one step procedure by adding a dedicated switch or at least allow you to set one of the buttons as mirror lockup button in the custom menu. It is still buried deep inside the custom menu. The 7D has 3 custom user settings. You can preset a certain set of shooting modes and custom function to one of the three Custom User Setting position (C1, C2, C3 on the shooting mode dial). Say you can set M shooting mode, Long Exposure Noise Reduction and Mirror Lock Up in the custom menu and then register this combination to one of the 3 Custom User Setting position. So for example, you can have one set of setting for shooting long exposure night photography and set it ti C1. Another set of setting for shooting fast action sport and set it to C2 and yet another set of setting for shooting portrait and set it to C3. My menu has been available on Canon DSLR since the 1D Mark III. You can select up to 6 of your most commonly used menus or custom functions and register it to your My Menu setting. Perhaps the easiest way to make turning mirror lockup on/off a simpler procedure is by adding it in My Menu. The EOS 7D has Auto Lighting Optimizer, Peripheral Illumination, Hightone Priority and Hihg ISO Noise Reduction. All these features are available and work in similar manner previous Canon EOS cameras like the 50D and 5D Mark II. I will not go into them in details. You can read my 5D Mark II review if you want to know more about these features. The 7D supports Live View shooting like the 50D and 5D Mark II. Unlike on the 5D Mark II and 50D, Live View on the 7D can now be turned on by a dedicated button. There is a switch on the button that can be used to switch between Live View or Movie mode. Live View on the 7D basically functions similar to Live View on 50D or 5D Mark II. You can enable Live View or make different settings for Live View in the camera menu. There are 3 different AF modes. 1.Live mode is a contrast detect method of AF using the main image sensor. It is the autofocusing technique used in almost all point & shoot digicams. You can move a rectangle around the screen to anywhere and then press the AF-ON button to focus on the selected area. Live mode AF is a bit slo, but is decent and accurate under good lighting. 2. Live “face” mode is similar of Live mode, but has a “face detect” function that can detect human faces and when you press the AF-ON button, the camera will use contrast detect AF to focus on that face. 3. Quick mode lowers the mirror momentarily and use the AF sensor to autofocus before raising up the mirror .You can activate Quick mode AF by pressing the AF-ON button. It is preferable to use only the centre AF focus sensor when using Quick mode, as otherwise, you will not be able to know which sensor was used for autofocus. Movie mode on the 7D can be started by turning the dedicated Live View/Movie mode switch. Starting and stopping movie recording is accomplished by pressing the start/stop button in the middle of the switch. Full manual control for shutter speed, aperture and ISO is available if you shoot in M mode. The 7D has support for more resolution and refresh rate than movie mode on the 5D Mark II (Canon has announced that they will be releasing a firmware for 5D Mark II next year for 1080p24 and 1080p25). The 7D supports the following resolution:- 1080p30, 1080p25, 1080p24, 720p60, 720p50, 480p60, 480p50. I have not had much time to play with the movie mode on the 7D, but the 1080p movie captured I have tried all looked pretty good. The 7D viewfinder is large and bright, noticeably larger than on the 50D. It is still slightly smaller than on the full frame 5D Mark II though. The 100% view is a welcome improvement, a first for a non 1D(s) series EOS camera. It is nice to be able to do exact framing in the viewfinder. You can see a full set of info in the viewfinder including shutter speed, aperture value, ISO, +/-EV value, buffer size, battery info and a few other settings info and warning. Canon officially quoted a continuous shooting rate of 8fps, with 126 JPEG and 15 RAW images. I tested the 7D continuous shooting performance with a PhotoFast GMonster 533X Plus 16G CF card, one of the fastest card currently available on the market. I managed to consistently get 20 RAW captures before the camera slowed down. With JPEG captured, the camera just continued shooting at 8fps until I lifted my finger from the shutter release. I did not want to waste too many shutter counts, so I did not want to continue shooting to see when it will slow down. Anyway, the camera managed to shoot 137 shots after I lifted my finger. I have no doubt that it can shoot more than 137 shots continuously with a fast CF card. I can only say this is exemplary performance. In general, I find the 7D AF system to perform really well. At low lighting, it performed significantly better than the 5D Mark II or even the 50D. All the cross type sensors were able to lock on to target focus quite easily even under very low lighting. I am not really a sports or bird photographer and I have not really had a chance to test out the AF servo tracking ability of the 7D extensively. But I have tried this test. I was sitting as a passenger on a car traveling on a highway at about 100 km/h. I tried tracking focus on cars coming towards us at the opposite direction, and the camera was able to nailed focus for most shots, at least 90% of the shots. A car is quite a big object and perhaps not the best test, but I am quite satisfy with the results myself. All the samples posted are Large/Fine JPEG with High ISO speed noise reduction set at 0:Standard. You can click on the following links for full resolution jpeg samples from ISO 100 to 12800. All RAW files from ISO 100 to 12800 were converted to TIFF with Canon Digital Photo Professional and then converted to JPEG with Photoshop CS4. No further post-processing was done. You can click on the following links for full resolution RAW converted samples from ISO 100 to 12800. Overall, I think the 7D image quality is very good and the high ISO images look quite good even up to ISO 6400. ISO 12800 should only be used for emergency purpose though when getting a photo at all is better no no photo. Before the 7D came along, the 50D was the previously top APS-C DLSR from Canon. So it is an obvious choice for image quality comparison. It would be interesting to see if Canon can improve or at least keep up with the image quality of the 50D. I have made 2 sets of comparison. The first set with 50D files up-sized to match 7D resolution. The second set with 7D files down-sized to match 50D resolution. A Canon EF 50mm f1.4 USM lens was used on both cameras and set at f8. The cameras were mounted on tripod with mirror lock-up on and shot with self timer. So let’s start with the first set. The 50D images were up-sized to match 7D resolution. The 7D crops are on the left and 50D crops on the right. Both cameras were focused on the eye of the teddy bear and I used Live View and zoom to maximum to check and make sure focus was right on both cameras before shooting. For the next set of 100% crops, the 7D images were down-sized to match 50D resolution. The 7D crops are on the left side and 50D crops on the right side. I cannot see too much difference between the 2 camera at low to moderate ISO levels, but from ISO 3200 onwards, the 7D seems to manage to pull ahead of the 50D, with lower noise level while retaining at least the same level of detail. The advantage seemed to be more as ISO went up higher. I would say 7D images are quite usable up to ISO 6400. On the 50D, I would be reluctant to use ISO 6400 unless absolutely necessary. I am sure there are going to be people who may criticize me for comparing the 7D to 5D Mark II, which is a full frame camera and also significantly more expensive than the 7D. However, there has been lots of discussion and arguments about comparison of image quality and high ISO noise level between these 2 cameras on various forums, so I thought it would be interesting to do a image quality comparison between these 2 cameras. Before I start with the comparison, I have to say that I was personally quite shocked with the results initially. In fact I made 4 set of different comparisons to make sure that my results are valid and that I did not make any gross mistake during the comparison (this was one of the main reason why it took much longer to do this review than I first anticipated). Because the 7D is a APS-C cropped frame camera and the 5D Mark II is a full frame camera, there would have different field of view (FOV) if you mount the same focal length lens on them. So, as to keep the composition and FOV of the testing image roughly equal, I initially used a Sigma 30mm f1.4 lens on the 7D and a Canon EF 50mm f1.4 USM lens on the 5D Mark II. I was quite surprised to find the 5D Mark II images looked significantly sharper than those from 7D, even at ISO 100. To rule out a problem with the Sigma 30mm f1.4, I next made a set of comparison with a Canon EF 16-35mm f2.8L USM on the 7D set at around 31mm and the Canon EF 50mm f1.4 USM on the 5D Mark II. I got essentially the same results. To rule out that I have an exceptionally sharp copy of EF 50-mm f1.4, I made yet another set of comparison. This time with the Canon EF 16-35mm mounted on both cameras, with focal length set to around 21mm on the 7D and 35mm on the 5D Mark II. Well, I got the same results again. So I made a final set of comparison. This time I used the same Canon EF 50mm f1.4 on both camera, but I moved the 7D further back than the 5D Mark II as to get similar framing and FOV, of course the perspective are a bit different. With the same prime lens on both camera, I am quite sure the results I get will not be due to using different lenses. There is one other thing I tried to rule out. Because I used f8 for all the test shots, I was thinking if the 7D maybe getting to diffraction limit at f8 and was causing the images to be soft. I have actually made a set of test shots with the 7D with EF 50mm f1.4, set at different aperture from f2.8 to f16. None of the images at larger than f8 aperture were appreciably sharper than the one at f8. So I can conclude that at least for my set of tests, the 7D was not diffraction limited at f8 with the EF 50mm f1.4 USM. So we will start with the comparison now. The 5D Mark II images were down-sized to match the 7D resolution. The 7D crops on the left and 5D Mark II crops on the right. The 5D Mark II images looked significantly sharper with better local contrast at all ISO. In theory, there should not be a great difference in perceived resolution between the 18MP sensor of the 7D and 21.1 MP sensor of the 5D Mark II. I do not know why the 5D Mark II images look sharper, but if I were to guess, I think maybe the 5D Mark II has a significantly weaker anti-aliasing filter than the 7D and that could be the reason why the 5D Mark II images looked sharper. To put things in perspective though, you have to remember these are 100% crops. The 7D images do not look soft in isolation or when viewed at more realistic sizes. 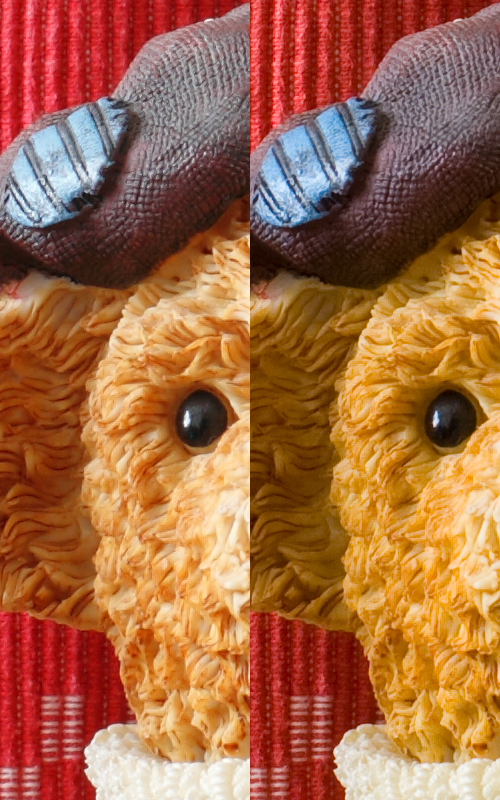 They only look soft when compared side by side with 5D Mark II images. At ISO 1600, the 5D Mark II already looked to have slightly less noise than the 7D, although the difference is very minor, at higher ISO like at ISO 6400 and 12800, the 5D mark II noise advantage is appreciably bigger, while at the same time retained image detail better than the 7D. Although I have already said I have tried shooting at different aperture values to make sure diffraction limit would not significantly affect the sharpness of the images I got with the 7D. Still some people still kept saying that f8 made the 7D shots looked soft. So I will now post the result of 7D sharpness at different aperture value. All shot were made with 7D and EF 50mm f1.4 USM at ISO 100 from f2.8 to f8. The follow 100% crops compared different aperture values to f8, so you can see if smaller apertures are sharper than f8 or not. All the right hand side crops are f8, and the other aperture values on the left side. As far as I can see, none of the crops from larger aperture settings are significantly sharper than the f8 crop. Some people also suggested that maybe the sharpness of the 7D at 100% maybe affected by the RAW conversion quality of DPP and that other 3rd party RAW converter may do a better job. I am going to show comparison between conversion from DPP vs Lightroom 3 Beta and Capture One Pro 5. All the 100% crops are from the same ISO 100 7D shot processed with the 3 different RAW converters. The crops from DPP are on the left, and the others on the right. The 100% crops from Lightroom 3 Beta does look slightly sharper than the one from DPP, but the one from Capture Pro 5 looks softer. So would the Lightroom produce a 7D file that is as sharp as one from 5D Mark II? Let’s find out. 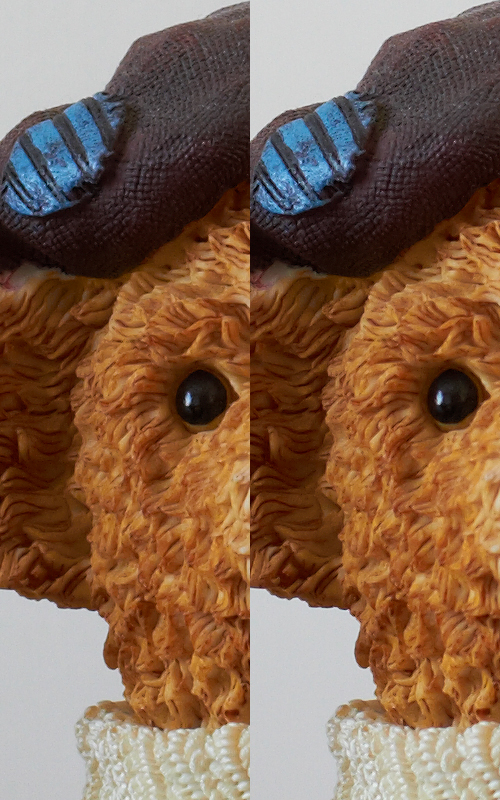 The 7D crop is on the left and 5D Mark II crops (downscale to 7D resolution) on the right. You can decide for yourself if the 5D Mark II still looks sharper thane the 7D crop or not. Will Upscaling 7D to 5D Mark II Resolution Make Any Difference? There were a few who suggested that maybe downscaling the 5D Mark II images made them looked sharper than 7D and perhaps upscaling the 7D crops instaed would make a differene. Well, I will just show one comparison at ISO 100 with 7D shots upscale to 5D Mark II resolution. The 7D crops on the left and 5D Mark II on the right. You can see for yourself if the 5D Mark II crop is still sharper than 7D or not. Help! Can I Turn The 7D Into 5D Mark II? Well, I don’t actually mean I want to physically change the 7D into 5D Mark II. I was thinking if can make the 7D images look similar to those from 5D Mark II with some post-processing. Well, the first difference I noted between the images other than sharpness is that the 5D Mark II images seemed to have better local contrast. So I would first try to apply some local contrast enhancement using the Unsharp Mask filter in Photoshop with Amount set to 20 and Radius set to 50. We will first see the original crops at ISO 100. Now with local contrast enhancement. The images from the 2 cameras now look quite similar as far as local contrast is concerned, but the 7D crop is quite soft compared to the one from 5D Mark II. So maybe we can try adding some sharpening now. How, the 7D crop looks quite similar to the one from 5D Mark II. The 5D Mark II crops perhaps still just showing tiny bit more detail, but the difference is not as great now. However, because of the heavy sharpening, there is some noticeable sharpening artifact in the 7D crop. I think this technique will work quite well on low ISO images, but will it work for high ISO? Well let’s see. I have applied the same processing to the ISO 6400 crops. We will first see the original crops. And now the processed crops. Although the 7D crop now looks sharper, but there is more noise and image detail is not really any better than the unprocessed crop. So I would say this technique although useful on low ISO shots, is not beneficial for high ISO shots. This section will come later. The 7D has many welcome new features like a good “pro” quality body built with full environmental seals, 100% viewfinder coverage, a new and much improved AF system, remote flash control, fast 8fps shooting rate and large buffer…and the list goes on. Many people including me, were not exactly excited with the EOS 5oD image quality especially at high ISO. Many felt that Canon should not have increased the 50D sensor resolution to 15MP, and by staying at 10 to 12MP, the 50D high ISO performance may have been significantly better. There was the worry that Canon has once again raised the MP count on the 7D to an unprecedented 18MP. With a smallish APS-C sized sensor and huge number of pixels, many feared that the 7D high ISO image quality may take a further turn downwards. Well, I am happy to report that all these fears are unfounded. Canon has pleasantly managed to cramped more pixels into the sensor while managed to give high ISO images that is better than the 50D. I would be quite happy to use the 7D up to ISO 6400 if needed. There are many people who think that the 7D can even rival the 5D Mark II at high ISO. However, make no mistake, after my testing I have to say that although the 7D is quite good at high ISO by itself, it is still no match compared to the 5D Mark II. The 5D Mark II has at least 1 stop advantage I would say at high ISO. Not only is the noise level less on the 5D Mark II, but detail retention is also noticeably better too. Is the 7D a worthwhile upgrade for xxD camera owners? Well, for 40D or older cameras, the answer is definitely yes. Even for the 50D, I still think it is a worthwhile upgrade. There are many improvements and new features, and the image quality is also better especially at high ISO. The only problem is that the 7D is appreciably more expensive than the 50D, but if you can afford it, it is definitely a better camera. In my opinion, the 7D cannot replace the 5D Mark II. However, I really see them as different cameras. The 5D Mark II is a full frame 21.1MP camera which is good with landscape and portrait, and also good at high ISO. The 7D would make a much better sports, action and wildlife camera, although it is still quite competent in shooting landscape and portrait. The 7D would make a nice 2nd body to complement the 5D Mark II, rather than to replace it. Is there anything that can be improved with the 7D. For one thing, and I am not the only one who make this complaint, I hope Canon will one day give us a dedicated mirror lockup button. I also hope Canon will add a second multi-controller on the battery grip. For portrait shooters using the battery grip, the multi-controller is impossible to reach. Setting custom white balance should be a easier task too. It should be a one step or maximum 2 steps routine, but at present it is a 3 steps routine, which is unnecessarily complicated. As in previous Canon camera, Auto WB is also rather poor for tungsten lighting, and can certainly be improved. Overall, I think Canon have succeeded in most areas in giving us a camera that is better than any previous APS-C offering before. The 7D is undeniably the flagship Canon APS-C camera. I have no hesitation in recommending this camera. Probably one reason you didn’t see the same sharpness in the 7D shots is that the lenses you used in the test have worse performance (MTF) at higher lines-per-mm than would be needed to make full use of the 18 MP sensor. So if the lenses were sharp enough, your tests at f/5.6 should have shown more resolution at this f stop than they did at f/8. I have performed this test on a 50D with the 24mm f/1.4 lens and the results at f/5.6 are visibly, if slightly, sharper than at f/8 )and quite noticeably sharper at either than at f/14 (this was a test of diffraction)). This difference shouldn’t be too surprising, since many of the lenses you used test more blurry than the 24 in reports on the web. The issue here is that very few if any high-resolution lenses were optimized for the APS format–most of them are simply full-frame lenses whose output is “enlarged” by the APS crop factor. Your theory maybe true, or maybe not, I really don’t know. As I have mentioned in my review, I did try a test making test shots at different aperture settings. I did not see any significant increase in sharpness or resolution with aperture larger than f8. The reason I chose to use a smallish f8 aperture was that, the depth of field with larger aperture was too shallow. Yes, I do understand about diffraction limits and the often talked about “high resolution” APS-C sensor like that one of 7D out resolving most lenses. While I believe there must be truth some of this, I failed to understand why as some people would suggest, a soft image can be explained by the sensor resolution out resolving the lens. If the lens resolution is not as high as the sensor, I can understand it would limit the combine resolution to the lowest common denominator, but it seems wired o suggest that the same lens if mounted on a camera with a sensor that does NOT out resolve the lens, would look sharper than one with sensor out resolving the lens. No sensor “out-resolves” good lenses, that is pure nonsense. I don’t know what got people into this simplistic thinking. If it had identical resolution, the final result’s resolution would be HALF of the sensor’s. We’re talking about an “analog copy” here, the copy can never be as good as the source, and the better both parts are, the better the end result is. There is always some gain unless one of the two parts approaches INFINITE resolution. So far, the lenses were so much better that they were, so to speak, near enough infinity compared to the sensor’s resolution. This is changing now, that’s all. Plenty of old sources list color ISO100 film with far higher resolution figures than any current DSLR sensor. Why were the final results not nearly that impressive? See second paragraph. Film needs one additional enlargement stage. The huge discrepancy in the image quality between the 7D & 5D Mark II cannot simply be attributed to the AA filter. The real reason is simple: Pixel Size. The 5D Mark II sensor has a pixel density of 2.4 megapixels per square centimeter. In comparison, the 7D has 5.4 MP per cm sq. That is a staggering difference in pixel size — 7D pixels are less than half the size of 5DII pixels. Consequently, the 7D sensor is far more demanding of lenses than the 5DII sensor. It’s the law of diminishing returns. The smaller of the pixels, the harder it is to squeeze more resolution from the lens. Simply put: the quality of individual pixels in the 7D simply aren’t on the same level as those on the 5DII. Not just in terms of high ISO image quality, but for low ISO contrast & sharpness as well. Thanks for your input. What you suggest maybe true indeed, or maybe not. I understand what you are trying to say. I can see your point about “The smaller of the pixels, the harder it is to squeeze more resolution from the lens”. However, just because the small pixels cannot squeeze out more resolution from the lens does not mean less resolution, does it? Say if you have a lens with resolution of 2500 and you mount it on a cameras, one a cropped frame with resolution of 2800, and on a full frame camera with resolution of 2500. Maybe I am oversimplifying this, on both cameras, one should get a combine camera+lens resolution of 2500. However, you seem to suggest that the cropped frame camera would produce a even lower resolution with the lens. Try to count everything in lines per mm on the sensor… the 5D MkII can get a maximum of 78 pairs per mm, that mean about 1872 pairs on the height of the picture… to get exactly this amount of detail on the 7D you need about 125.6 pairs per mm… as you can imagine for a given lens it’s way easier to provide 78 pairs per mm instead of 125.6 pairs per mm, that’s why the image on the 5D looks way better on detail, just 5D is less demanding on a given view size of the image. The combined resolution is 1/((1/x)+/(1/y)). Lens 5000, sensor 2500 = result 1667. Lens 2500, sensor 2500 = result 1250. You don’t seem to realize this is about the basic concept of an analog copy. An analog source copied with identical quality ends up at half the quality of the source. Whats interesting is I used to shoot a 24-70 on my sub frame, and got sub par results (pardon the pun). Relatively blurry at 100%. Stopping down did not help (which is odd). Frustrated, I sold the 24-70 and got a 17-55, and things are so sharp on the 7d I really cannot ask for more. This does actually bear out what Issac and Jensen are getting at…. But it may be that the sub frame lenses are able to produce sharper results as they do not have to be designed to produce as big a image circle…. I would be interested in seeing this same sharpness comparison with a sub frame lens that is optimized for a sub frame body (such as the 17-55IS or the new 15-85IS). If you look at their blur spot results on slrgear they both are quite impressive, especially compared to some of the classic film lenses (24-70, and 16-35). When compared to the 24 – 70 and 16 – 35, sharpness from the 17 – 55/canon 50D combination is on a par or better with the 17 – 55. Also check out the 10 – 22, another 1.6 crop lens: results were also on a par or better than comparable L-series wide angle lenses. It would be interesting to see a comparison between a 7D/17 – 55 combination and a 5D/16 -35 combination. Will the 5D still have the sharpness edge? I don’t have either the 24-70mm or 17-55mm, so I can’t test hose lenses. I do have EF-S 10-22mm and EF 16-35mm f2.8L II. I have actually tried comparing the 7D with 10-22mm and 5D Mark II with 16-35mm first, but after reshooting a few times, the shots from 7D with 1022mm were significantly softer than those taken with 5D Mark II with 16-35mm. By the way, I have read the photozone.de review of the 17-55mm a long time ago and I am sure it is a lens with excellent optical quality. But a lens review alone does not prove that 7D with 17-55mm is just as sharp as 5D Mark II. Wow, that 5dMkII really is crap, huh? Kidding! What a great camera I only wish it would shoot like 6fps! Dear Roland, what a careful and in depth honest review! I am also pleaesed that the 5D M2 still hold its edge(s)! I am contemplating between a panasonic GF1 or the 7D as a complementary camera to the 5D M2 in the future. Which one would you recommend (as you have played with the pen as well)? The temptation for a GF1 is it’s size but I am uncertain how truly useful it can be in terms of quality of photos compared to the EOS. Perhaps you can share your thoughts by referring to the PEN. it is all about convenience vs quality. When I reread some of the older reviews of the 5D and 5Dmark 2 there are comments in hard-to-explain quality of a full frame camera. I am no expert but I had the same feeling comparing the mark 2 to my older 40D etc but I suspect it is the L lens effect too. There is always a sense of joy in taking photos with the mark 2 – images almost always turn out beautifully. I am not sure if you feel the same and if so do you feel that there is more of a joy in the pen than the 7D? Thanks for sharing your in depth and qualitative review! Look forward to kore of these and your comments. Thanks! The Pen or the Panasonic GF1 are totally different animals compared to either 7D or 5D mark II. IMHO, neither the Pen or GF1 can really rival the image quality from 7D or 5D mark II. But the point about micro 4/3 compact cameras like the PEN and GF1 is that, they are small and compact cameras, much smaller and lighter than most full size DSLR. However, they share many abilities and has image quality that si much closer to DSLR than any point and shoot digicams. Nice review, Roland; I followed the link you posted in dpreview. Thanks for the review. 5D Mk2 is now on my wishlist. I own a 20D, 40D and 50D. Btw JanShim recommended me your blog when I asked him about 5D Mk2 and 7D. A very good review again, looks to be a good camera for African wildlife. Thanks Louis! I certainly hope to meet your family next time you come to Hong Kong! Wow, this is an excellent report! Very balanced. Gives real insight in FF-APS. Very detailed and infromative. I wasn’t surprised that the 7D shots were soft by comparison to the 5DII shots prior to post processing (local contrast enhancement and sharpening). Look at the MTF curves for any lens and you will see that contrast is inversely related to detail frequency. When you back up to get the same FoV with the 7D + 50mm as you do with the 5DII you are essentially making the image details smaller as projected by the lens onto the sensor. Naturally the contrast of those smaller (higher frequency) details will be lower. I was glad to see you apply 7D specific post processing in your review to see if you could recover that lost contrast and equalize the images. IMHO a proper comparison of any two cameras in the digital age must include camera-specific and optimized post processing. Too many sites make the mistake of using uniform settings. After proper post processing the 7D produces large prints which are indistinguishable from 5DII prints at low to mid ISO. But the same processing which equalizes image quality at low ISO increases the differences at high ISO. The 5DII is the high ISO champ by a large margin. IMHO unless you frequently need to make large prints from high ISO shots, the 7D is the better buy. Thanks for good review, I been reading your review since the 50D. I have a 40D now and my question is, if I should replace it with a 7D($1200 US different) or save the $1200 and put it toward the 5D MK III(hopefully it will be around 25M pixel with low noise performance and all the cool feature from 7D) when it come out, I am sure when 5D III come out there is a replacement for the 7D is very close to release, that is where my other $1200 come from. I am leaning to wait until the new 5D release because I am still happy with my 40D. Thanks again. This is a very good review, but the results don’t surprise me at all because it seems that a bigger sensor will invariably produce better quality images than a smaller one, even when should they theoretically have the same resolving power. I have owned every XXD,XXXD body to date. This body should have been relased in that range but market demands drove it to a seperate lin, nonetheless, I will own 3 or four of thesefor my business as well as 5D Mark II’s and several 1Series as they all have different pro’s and cons. One body may fit a certain cstomer perfectly, but for my professional needs I use all sensor sizes. And it puts Nikon back in it natural place as No. 2! They need to watch out for Sony as their offerings are getting very competetive. What good is an optical viewfinder if you cannot focus properly? The lack of a screen like the 5D2’s Eg-S means you have to rely on AF with the 7D and can never manually focus f/1.4-f/2 lenses properly since the bright standard screen only displays DOF at about f/4.5. The fixed focusing screen is an absolute deal breaker from my point of view. Nothing beats the 5D2 + Eg-S + KPS UMC viewfinder magnifier. The only affordable combination that comes close to a 1980s manual focus SLR. very nice review. Thank you for providing this service to the community!! 2) more importantly: what happens as you adjust the level of illumination in the images? I.e., high ISO performance might vary depending on the absolute amount of illumination on a subject, so it would be quite interesting to see the comparison with poorly lit subjects. Again thanks very much for your very well done review!! Are you sure the focus point is the same on the 7D vs 5DII shots? If you compare the white stitching on the red towel you can see it’s more in focus and more detailed in the 7D shots, especially noticeable on higher ISOs like 400 and up. This might explain some of the lack of detail on the bear’s hat in the 7D shots. No doubt the FF sensor in the 5DII is better, but maybe the 7D isn’t as bad as it seems in those comparisons? Yes, I am 100% sure there were both focused on the same point, the teddy bear’s eye. The reason the background red color texture looked sharper on the 7D crops than on 5D Mark is because the 7D has a large DOF than the 5D Mark II. There is some yahoo misrepresnting your article over at DPR. Thanks! I read the thread last night and replied to it last night. Looks like dpreview forum admin killed the thread now though. Not thre anymore, which is just as well. Excellent review Roland. I’ve added you to my feed. Keep up the great work. so far I have read all of your findings here and they are highly appreciated. I still am in doubt for my next camera and I hope you can give me your idea about it. I mainly shoot fast action sport photos with my 40D. I like the burst rate of 7 photos per second and the crop factor of 1.6 times very much, but often I am not happy with the result concerning the details in my photos. For example: I use my EF100-400mm IS L lens for kite surfing photos. When possible I use a monopod and mostly, when the light condition allows me, I shoot at 1/500 s or better with ISO 200 or worse. Because I often need to crop the image to a more interesting composition 18MP instead of 10MP on my 40D seems a welcome change on the 7D. However my 40D photos are quite similar to your 7D results presented here and now I end up confused. Should I go for the 5D mark II for better quality images ( more detail and more saturated colors, but giving up the camera crop factor, -so I need to crop even more- ) or do you think a 7D will would be a better choice, because of the improved AF and the fast burst rate? I know that the crop factor of the 7D gives me more zoom and less crop for my photos than what I would need on a 5D mark II with the same lens, but I am interested in the final overall result. What I see in your review of the 7D is that the photos mostly seem too soft and too flat for what I like for sport photos. I much more like the results of the 5D mark II here. Knowing that I like fast action shooting at long distance, what camera would you recommend when I had money for both types? So with the same lens on a 5D mark II or on a 7D -and say a cropped final result of 3000 x 2000 pixels- what would be the most crispy result? Your valued opinion would be highly appreciated. In my opinion after testing the 7D, I believe that it is a geat camera capable of giving veru good results. I believe that it can give ver sharpp photos. It’s only when viewd at pixel level and directly compared with 5D Mark II, that the 7D appears softer. For sports and action I would choose the 7D over the 5D Mark II personally. thank you very much for your honest opinion. This whole in depth review about the quality of this camera supported with your detailed images helped me a lot to decide. Way to go ! thanks dude! nice detailed one you wrote there! am getting one! I would like to thank you for an unbiased and insightful review. I currently have a 40D (I have been very happy with it). I work part time for a specialty magazine and the photos publish very well in both color and black and white (that should be little surprise to anyone). However, I am in the market for the 7D and believe I will be buying one in the near future. Your review has helped solidify that decision. Although both 50D and 500D has a similar 15MP sensor, but there are actually many differences between these 2 cameras. The 50D is better built with a metal body, larger and heavier. The 500D is made of plastic and is lighter and smaller. The 50D has body ergonomics and control compared to the 500D. The 50D has has a better AF system, larger buffer and faster continuous shooting rate. There is one thing that the 500D has that the 50D does not, the 500D has movie mode. There are too many differences for me to list them out here really, I have already named quite a few and if you still can’t see much difference, then perhaps you are one of the few lucky ones that don’t need to spend more money to buy the better camera. Thanks for your the wonderful review. Somehow i seem to see from you image comparison of your 7D and 50D shots that the latter seems a little sharper. Noise on both seems the same up to iso1600 with 7D better from iso3200 onwards. Is this your observation as well? Nevertheless 7D seems attractive to me. Personally, I don’t see a great difference between the low ISO quality from 50D and 7D. I would say there are very similar. I would not say one is really better than the other. But the 7D is definitely better at high ISO compared to the 50D. Hi Rolland, great review fully enjoyed it and have bookmarked the site. I have had my 7D for only a week so I am still learning to drive it. It is a quantum leap from my 20D! I have a query concerning the auto white balance. The camera doesn’t seem to be able to cope with late afternoon sun in landscapes. As we all know there is a fair bit of red content at that time of the day and my 20D on AWB copes quite well but not the 7D. I realise I can get around the problem with a custom setting of the white balance but I am surprise at the amount I have to reduce the high, mid and shadow, red channel content in my jpeg images using AWB? I usually shoot in aperture or shutter priority and I have tried various combinations of picture styles but with the same results. It may be driver error but I would appreciate any comments or recommendations. Otherwise I am more than happy with my purchase. I have not really encountered your problem about AWB of the 7D. However, for shooting landscape during late afternoon, it’s nature to have a warm reddish tint. That’s the color of the light and I personally actually like the warmth of the late afternoon Sun. If the camera AWB or if you purposely set a custom WB that is absolutely neutral to remove the warmth, it would not look like late afternoon light at all. But that’s my opinion and preference, maybe you prefer something else. fantastic 7D vs 5DmkII shots … much appreciated. i don’t suppose you could post normal sized side by side pictures of the two? so we can see if the differences are negligible if not 100% cropped. Well, I’ll see if I have time to do that. I personally am not a pixel peeper actually and don’t always blow up all my photos to 100% to see them. I just did the 100% crops for review purpose only. However, I doubt if you can see much difference between 7D and 5D Mark II with normal web size photos though. thanks Roland! you’re my new favorite cam body reviewer! Mike C fully agree with you, Roland has done a great job. I’ve personally never come across his site before but it’s definitely bookmarked now! Roland I understand what you are saying about the afternoon light (photography as been my hobby for almost 60 years!) But the red cast on my images seems excessive. I have read elsewhere about critisism of the AWB not being able to cope in some indoor shots. However I have seen no reference as to any excessive Red bias. But as I said previously it’s still early days for me with the 7D. When I have time I will duplicate my shots with the 20D and do a side by side comparison. Thanks for a very helpful review Roland. One thing I should also comment on … I remember the initial criticism from all and sundry about the wisdom of the 50D’s 15 MB … Canon seems to have proved they have the technology to support their drive for higher and higher sensor densities. Have you tried(in DPP toolbar), to set the luminance noise reduction to 0. Perhaps the luminance setting is higher by default for the 7d. I find that my images look a lot sharper when I set the luminance to zero, or reduce it. No, I have not tried that. I don’t use DPP anymore for the 7D now that 3rd party RAW processors are supporting the 7D. I’ll give it a try if I have time though. Thanks! It’s interesting how you tried to match the shots from the 5D Mark II by using Local Contrast Enhancement and Sharpening. But this is pretty pointless in my opinion because you can make the same enhancements to the 5D images, improving them even more. 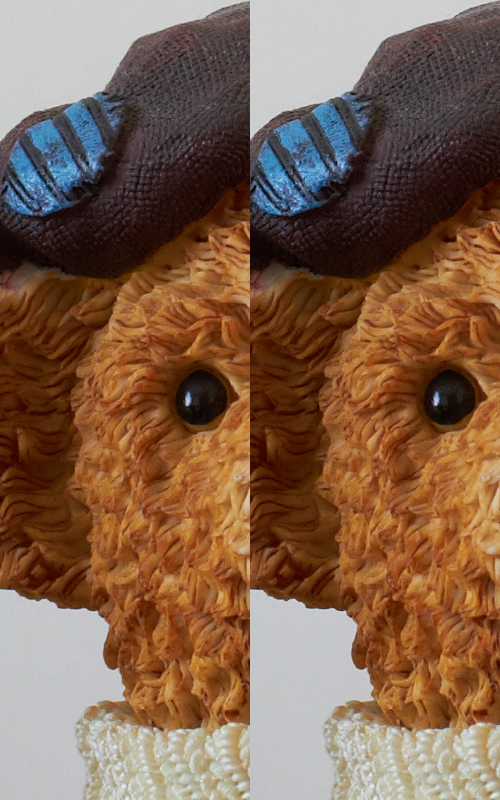 Also, there are some serious sharpening artifacts in the enhanced 7D images and they still don’t match the amount of detail. Hi Rowland and all. I have carried out a number of tests with the 7D on AWB and compared them with my 20D on AWB. I used the same scene for early morning and late afternoon shots. I used the standard 18 to 55 mm lens on both bodies. and also my Sigma 18 to 125mm DC OS lens in case there was a difference between lenses. The 7D shots had, as I suspected a definite excessive bias to Red compared to the 20D. I shot the same scene’s again with the 7D white balance set to daylight. The results were satisfactory and compared well with the 20D AWB shots. the camera overall but I have to admit this issue of the AWB has disappointed me. I would welcome any input from anyone else who has found the same problem. Excellent review. Your methodology of the review is the best that I have seen in any site. This is the first time that I have ever seen any review that try to take the potential problem of diffraction into account. More power to you. I would like to help explain why the D5-II picture is sharper than the 7D. It is due to the fact that 7D is a crop sensor with the dimension of 0.628X of the full frame sensor. In order to have the same total resolution of the full frame, the lens will need 1.6 times better resolution( line pair per mm). That is a lot of extra requirement to put on a lens that is designed for a 35mm camera. As Issac said on 7 November, for D5-II, all we need is a lens that can resolve 78 lp/mm, while for 7D, we will need a lns that will resolve 124.8 lp/mm. 78 lp/mm is an easy task for most of the lenses while 124.8 lp/mm is a lot to ask from even the best of the prime lens. So the 7D is resolution limited by the lens. There is another gentlemen in this forum mentioned that there is no such thing as resolution limited and the lens resolution is approaching infinity. He may be right for a $10,000,000 lens. I will respectfully disagree with him on photographic lens. Anybody can look at lens test section in the dpreview, he can see that even the canon F1.4, 50mm is resolution limited even with a 15 mp sensor. The 7D is a 18 mp sensor. Another factor that make the 5d-II picture better than the 7D is the noise. Due to smaller pixel size, the sensor of the 7D is noiser than the 5D-II. The 7D may use more noise reduction and sacrifice the resolution and contrast for a less noisy picture. Roland, I do have a request, what is the chance for you to shoot more test shot of the 7D with the contract and sharpness turn up one or two step on the camera. It will be interesting the compare these with the 5D-II. Also what is the chance for you to take some shot with reduced resolution ? This will give us a feel whether is is worth to shoot 18 mp all the time while high reolution picture is not needed. Thanks for a great review again. Thanks for the comments. I don’t know if I will have time to do the test you requested, but if I can find the time, I will give it a try. I changed the sharpness level up 1, and then tried up 2. There was a good enough difference, that I have left it at up 1. Bravo!Awesome review! I wanted to know. Taking the image to photoshop, would it help improve the the 7D crop image to look very similar to the 5DmII by duplicating the image into a new layer and adding a blending mode like hard light or overlay… ect. adjust the opacity to keep enough detail in the shadows… save it as a 16 bit tiff. Open it lightroom or adobe raw to finalize. what is your view? There is always ways of improving an image form the 7D (or any other DSLR for that matter) by doing post-processing. I have not tried what you talked about, but the thigh is that, whatever you do that can improve a 7D image, you can do the same on a 5D Mark II image, so if there is a gap between unprocessed image quality, there will still be a gap with post-processed image quality. Hi Roland——can you please explain to me about the Canon 7D 1.6 crop factor and what it actually means? ?——explain not only on the telephoto side but on the wide side as well——-I plan on pairing the 7D with a Canon 16-35 2.8 lens—–how will the crop factor affect this lens? ?——-on the 16mm side? ?——what wide angle lens do you recommend for the 7D? ?—–thanks for reply——-David P.
The simplified way of explaining it is that, on a Canon cropped frame camera, you have to apply a 1.6x multiplication factor any focal length lens for a equivalent field of view(FOV) on a full frame camera. For example, a 10mm lens on the 7D will be equivalent to a 16mm lens on a full frame camera like the 5D Mark II. A 300mm lens on the the 7D will be equivalent to 480mm lens on a 5D Mark II. That’s the simple way of looking at it. For picture quality between 7D and 50D, would it be a big different, would it be worth to upgrade to 7D from 50D only for picture quality. For picture quality alone, there is not much difference between the 50D and 7D at low to moderately high ISO, but at high ISO, the 7D is significantly better. thanks for the review….i was very shocked to see the results from 7D vs 5Dmk2…..
To me the 5d starts to look softer at High iso,with less noise. This is also what I have experianced when I have tested both of the cameras. Is there a function that has to be turned on or off from the 5d That I and others may have missed? To me, the 5D Mark II images do not look softer at high ISO compared to the 7D. There isn’t anything specific you need to set if you shoot RAW, but if you shoot jpeg, you can try turning down the High ISO noise reduction setting. As always, another outstanding and detailed review. Where you find the time to do it, is beyond me. Come and visit before the year is over. I recently spent a day shooting with both the 7D and the 5D Mark II without any intention of a scientific comparison. The same lenses were used on the two bodies with frequent switching of lenses based on the needs of the moment. When reviewing the many hundreds of exposures afterward it was immediately obvious that the 5D Mark II shots were sigificantly sharper than the 7D photos. My conclusion is that I will move away from small sensor cameras. I had the same experience shooting with the D300 and D3 although to a lesser degree. Both bodies having the same number of pixels. I’d hoped for better perormance from the 7D. Maybe the EOS-1D Mark IV will give me what I’m looking for. The 5D Mark II is a little too slow for what I need but the image quality is second to none. Hi Roland impressive review and a service to all us camera geeks out there. Thank you. quick question, did you notice any noticable difference in noise in the movie modes between the 7d and 5dII? Is it the same difference as the still mode? The effective resolution is different when shooting movie mode right? So does the noise become less of a factor in movie mode at higher iso’s? thanks! The 5D Mark II is better at high ISO with movie mode. Definitely less noise at ISO6400, if not 3200. Roland, you nailed it. I have both cams (5D2 & 7D), and you described them both precisely as I would have. The 7D is a remarkable device and a very good backup for the 5D2. It is a much appreciated improvement over the 50D (especially with high ISO noise & features). Grat job Roland. I forgot to mention that I also have the 50D too. You were right about that too. Thank you for the review and is totally thrilled as a owner of both the 5d2 and 7d to see the comparison. Was very happy replacing the 50d with the 7d, the higher usable ISO is a blessing for birding and it has become my grab and go until recently………. I started missing shots with the 7d in shadows while shooting birds. The 5d2 is more accurate with it’s AF while the 7d tends to back focus when the back ground presents more contrast than the subject in the shadow. Brought back to Canon, slight improvement but still not as accurate as the 5d2 or the 50D in shadows. Will be monintoring the situation and see if situation actually improves with updates as well as a new way of focusing my subject???!!!! Very nice review Roland, I think the 7D is a great camera also, but it definately does not unseat the 5D2. I think the 1DMKIV might do that though. Great review, thanks for the insights! I would also be very interested in knowing how the dynamic range on the 7D compares to the 40D/50D and to the 5D Mk2. Typically, I do a lot of wedding work, so the ability of the camera to record fine detail in both the bright whites and the dark darks is critical, even at the higher ISO. Many have discussed the fact that small photosites (sensels) translate into poorer dynamic range, so I am a bit concerned about this on the 7D. Since I do not print larger than 17″ x 22″, the resolution of the 7D is more than adequate. b) the focus on the front part of the brim of the beret is soft then gradually gets sharper until at some point beyond the plane of the bear’s eye it reaches it’s peak sharpness. 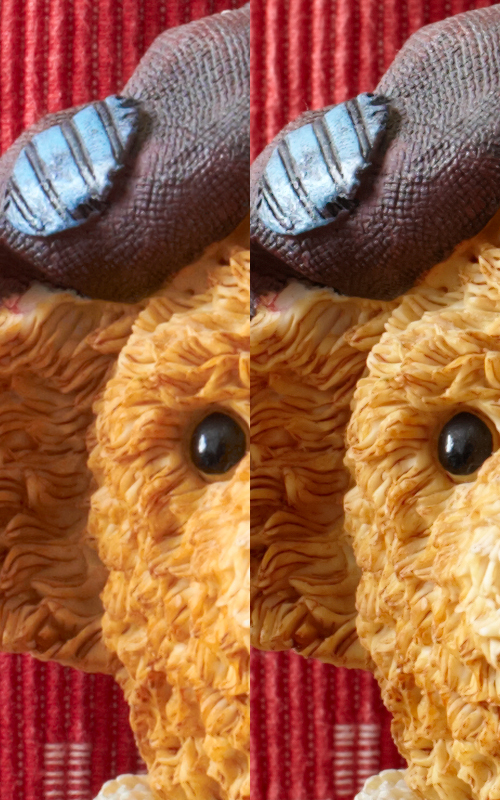 For whatever reason, the area around the bear’s eye is not the sharpest part of the 7D image. Perhaps it appeared sharpest in the viewfinder, and perhaps on the LCD at magnification, but something is off. A DOF advantage would not cause other parts of the image to be sharper than the point of focus. Thanks for the great review! I have been debating on buying a 7D. You have almost persuaded me to go out and get one! If you look at image quality alone, which is better the 7D or the Sony 850 or 900? I have been debating on 4 cameras, those 3 and the 5D MarkII. I would be selling large prints up to 20×30 or maybe even 30×40. Which one of these 4 cameras would be best for enlargements of this size? I have not personally used either the Sony A850 or 900, so I won’t be able to give you a definitive answer, but form what I have seen from the Sony cameras, my opinion is that at low ISO, the Sony cameras will have better image quality, but at high ISO, the 7D should give you better image quality. Overall, I believe the 5D mark II should give the best image quality, comparable to the Sony cameras at low ISO and better than the 7D at high ISO. After reading all experiences here I bought myself a 7D to replace my 40D. A few test photos later I was convinced of the right choice I made. This review was really helpful. The auto focus is way better then the one on my 40D and also the micro tuning abilities to eliminate front- or back focus lens problems is a welcome feature of this nice piece of equipment. More fun to come and much more tag sharp shots from now on. I know, compromises will always be there, but this camera makes you search pretty good to find one. Thanks from a happy sports photographer..
Hi Roland, You have done a great help to all the people in here. I admire and salute you. One question remains. Are you the Roland Lim of ChannelNews Asia ? I am afraid I am not the Roland Lim from Channel News Asia. There are quite a few Roland Lim around. If you do a Google search though, I believe you will find more links to my blogs and galleries than to Roland Lim from Channel News Asia. 7D’s 100% view finder is a lie? As far as I can see on my 7D, the VF is pretty much 100% or very close, certainly not 96-97%. This was a very big issue few days ago to7d users in S.Korea. Canon Korea Actually gave official announcement to 7D users in Korea that it is not 100%. Am glad you did your review again with 5dMK2 in comparison. Glad you njoyed ur new toy too. Unfortunately,my 5Dmk2 is still in HKG…will hope my unc will courier em back to me…since I’ve bought them when my visit in end Aug.
Nonetheless,was tempted to buy 7D but guess I will wait after I’m so satisfied with my MK2. Hope to meet you next time when I went to HKG again. I want to buy a new camera (probably 7D). I ussualy take picture in a party where there are not many lights or at disco party. What lense that you recomend? You will need a fast lens with large aperture. Depending on your shooting distance and budget, lenses like Sigma 30mm F1.4 EX DC HSM, Canon EF 35mm f1.4L USM, Canon 50mm EF f1.2L USM and Canon 50mm f1.4 USM maybe suitable candidate. I was very interested to read your review. I had just this day returned from my favorite camera store where I looked for a new camera to take , primarily, wildlife pictures and some, usually low light, landscape pictures. The staff recommended the 7D over the 5D Mark 11. I was skeptical so I decided to check it out elsewhere. I was glad to see that they and you pretty much agree. I will take their advice and save some money. First of of all I wish you a happy and healthy new year, enjoying nice pictures. I currently own a Canon EOS 30D, the 17 – 85 mm S lens and the 70 – 300 mm. Most of my pfotography is around landscapes, architectureand people. I like to print the best photo’s in the A4 format and some larger as well. There I find the 30D rather limited in sharpness. So I am considering the 7D and the 5D II but reading your excellent review I cannot yet decide considering on one hand the much better autofocus aspects of the 7D and on the other hand the better sharpness and less noise of the 5D II. What would be your advice? 7D with the new 15 – 85 IS USM (or better a L lens?) or the 4D II with the 24 – 70 L lens? If budget is not an object, then for landscape, architecture and people, my personal preference would be 5D Mark II. The DNG is sharper than CR2. I found the CR2 convert as DNG, it is sharper from the 7D from LR to TIFF 16bit, and it is before any sharpening applies, having made a comparison with both files, I confirm the DNG is sharper from the 7D. I am torn between the 7D and 5D Mk II. I’ve shot with the 7D and do like it’s performance, but I would like to go full-frame. What do you think of the AF performance? Is the 7D better than the 5D Mk II? AF performance is definitely better on the 7D. Thanks for an excellent review and comparison on both 5D2 and 7D. This would help my decision to purchase 7D (for now) or 1D4 (maybe later on) for a second body to fulfill my need of shooting wildlife/ birding and sports/fast action. I purchased the CTA brand LP-E6 battery kit for the 7D. But I thought cause it’s the same model battery the 7D uses that it could possibly work. the LCD, however it still allows the camera to shoot. Could this cause any problems to the camera? LP-E6 works in both 5D Mark II and 7D. However, official LP-E6 from Canon is a “chipped” intelligent battery and both 5D Mark II and 7D can use the chip to report data like percentage of battery life left and no. of shots used with current charge. The problem with your 3rd party generic battery is that, it is not chipped, and your 7D hence cannot read any data from the battery, hence cannot reprot battery level or any other data. In my experience, the answer is no. Hi Roland, thanks a lot for this review and especially for the number of comparisons you have gone through the pain of making and posting. What I don’t understand is why doesn’t Canon make another fullframe camera. Nikon has the D700 and D3 etc. While Canon just has the 5DII. I would love to see something like the 7D but with full frame. I have a 500D now and it’s OK, but I will use it until I get a full frame. I am not intending to get another APS-C camera as I can’t see how that would be an upgrade for my photos. But I may be totally wrong. I would like to thank you for the excellent review on 7D again. I just happened to “stumble” into you 50D review. At the end of the review you have done something very interesting. You gave us two jpeg pictures: one is a down sized 7.1 mp jpeg from a 15mp jpeg. the other one is a jpeg generated from sRAW. It is obvious that the sRAW picture is having less noise and sharper than the down sized one. So my question is if someone does not like or need a big 18mp picture. would it be better off to shoot RAW1 or RAW2 or just choose a smaller size from the camera?? Also have you found out more about the “pixel binning” of Canon. If they are doing pixel binning in RAW, are they also doing the same thing for in camera reduce size jpeg??? Thanks again. Although there have been rumors about Canon working with pixel binning, they have not applied pixel binning technology to any of the current shipping cameras. I have not had a chance to test out MRAW and SRAW with 7D yet, so I cannot say for sure if it would make a difference to shoot with the smaller sizes RAW files in the 7D. These will fit my needs. These are just basic guidelines, you will need to modify these settings according to your own needs. Very comprehensive testing. Alas, a cropped sensor cannot be totally matched against a full frame sensor- the law of physics will not allow it. I think that the final test is flawed a bit (longer distance for the 7d vs. 5d2) and also the fact that a great distance with a wider aperature results in more limited DOF. It’s possible the 7D shots were slightly out of focus and of lower contrast. Also, there is much more noise with such a highly packed sensor- the heat has to be channelled away effectively. The higher amount of noise/heat/gain will cause a greater amount of image degradation. Still, I believe Canon is pushing the envelope of sensor performance in both FF and crop sensor. I wonder if having a bigger heat sink will help reduce the noise quality of the sensor. Thanks for the comments. I am not going to debate or defend the results from my review anymore. I am done that already. However, I will just make a few remarks on your comments. You can argue that the final test was flawed because using the same lens on both cameras would result with different shooting distances and different DOF. However, even if you use different lenses on each camera, say 35mm(EF 16-35mm f2.8L II set to 35mm) on 5D Mark II and 22mm(EF-S 10-22mm f3.5-4.5 set to 22mm) on 7D and set to shoot at the same shooting distance will still result with different DOF (I have actually done this test already). The full frame 5D Mark II will have a shallower DOF. You can also use the same zoom lens and set to different focal length when mounted on either cameras, say a EF 16-35mm f2.8L II set to 35mm on the 5D Mark II and set to 22mm on the 7D (yes, I have done this test too). That will still result with a shallower DOF on the 5D Mark II. Of course you can set a smaller aperture on the 5D mark II to match the DOF too, but setting a different aperture value on either cameras would add yet another compunding factor to make the test even more difficult to interpret. You can of course say my test was flawed, but in essence, there is nothing that you can do to make the test truly ‘fair”. Whatever you do, you can always come up with something that my benefit one camera over the other. However, as I have said in the review already, after doing 4 separate set of tests using different lenses, same zoom lens set to different focal length on both cameras, using different prime lenses on either cameras and using the same prime lens on both cameras and I still ended up with essentially the same result. I am confidant and truly and honestly believed the results I posted was accurate. The way you explain is awesome…..
Would you please say how the Dynamic range differs btn 7d and 5D Mark 2? As we are getting shrp image, nice color, and many things from 7D like 5D Mk2 Why one should buy Full frame? Is there any significant benefit in FF? Since you said you are a novice, do you actually understand what you were trying to ask? Anyway, I just assume you do for the moment. The 5D Mark II has better dynamic range compared to the 7D, not by a huge amount, but definitely better. If you have actually read and understood my review, I really do not know why you need to ask this question in the first place. The 7D is a very capable camera and will give very good image quality, but IMO, the 5D Mark II has better image quality. Although not everyone will notice the difference, but the difference is there. There are many reasons for and against getting a full frame camera.I suggest you do a bit of research on the net first. This is not the place for me to give you an explanation on the pros and cons of full frame vs cropped frame camera. Lastly, I don’t understand why I needed to reply ASAP, ha ha. I am amazed at yr generosity and selfless sharing of knowledge . Tqs Roland. It is great to see that, in post, the 7D can be brought in line with the Mark ii. A very beneficial tip! (Not at high iso, but still…). I wish you had a 17-55 to test… but alas, we have what we have, after all, lol. I’ll be posting this on my blog eventually, it is too useful to not have it somewhere handy! Really good review. I choose the 7D instead of the FF 5D so I can keep my lenses, some are specifically made for a crop sensor and I like the extra range 1.6x it will give me. I specially like the fast focus option to be able to do some air-show photography. It is also a huge step forward from a Canon EOS XTi 10mp. 😉 My 7D will arrive tomorrow I can’t wait… Oh a battery charge takes 2.5 hrs. Picture Style settings simplify the control in-camera image quality. They can be likened to different film types, each of which provides a different effect. For each pre-selected setting, the photographer controls sharpness, contrast, color tone and saturation. The default configuration of the camera allows you to use JPEG images at once, without resorting to other menu settings. The Picture Style presets applied to RAW images can be revised with Canon Digital Photo Professional software. • Monochrome – for black and white shooting with a wide range of filter effects (yellow, orange, red and green) and toning effects (sepia, blue, purple and green). You can store a maximum of three settings Picture Style can also be downloaded from Canon site and of course create an almost infinite number with the software supplied Picture Style Editor. Picture styles are available in all current Canon DSLR and quite a few discontinued models as well. It is nothing new really. The 7D is an APC-C cropped frame camera and the 5D Mark II is a full frame camera. Canon APS-C cameras with a lens of given focal length will have field of view (FOV) equivalent to 1.6x the focal length on a full frame camera. So in your example, a 500mm lens on the 7D will have a FOV equivalent to 1.6 x500=800mm on a full frame 5D Mark II. But FOV equivalent is one thing, the really important thing is which camera has the higher pixel density, because the cmaera with the higher pixel density will give you higher resolution with a given lens at a fixed distance. Something which you will be doing shooting wildlife. The answer is the 7D, it has higher pixel density than the 5D Mark II and will be better suited to your purpose. The 7D also has better autofocus and much faster continuous shooting rate, and those factors should also be important for your kind of shooting. Thanks for the suggestion, but as you have said, it was not really possible. Of course the results could be different, but it could also have been the same, who knows? Hello…. full frame vs APS-C? Well, the reason maybe due to full frame vs APS-C, or it may not. What made you think you are so sure that was the definite answer anyway? Your guess is just as good as mine or anyone else. Without extensive controlled scientific tests, who would know for sure? Maybe you were really too overfocused as your name suggests. I admire the thoroughness and clarity of your review. I was in a quandary about which camera to choose for an upgrade from my venerable 20D, having missed upgrading to the 40D which some consider the value gold standard in Canon’s APS-C lineup. ( I accept opinions vary here and I am not trying to start a debate thread). If the only tie breakers are potentially larger prints from the 5D II and better quality images at higher ISO, you have helped me immensely making a purchasing decision. I hope I didn’t oversimplify your conclusions by misreading the article. It wasn’t a quick read. I am actually happy with the 20D but unhappy with Canon for their not providing a Windows 7 driver for the 20D. I shot tethered in the studio until I had to replace my laptop. Either choice apparently gets me back in the game here assuming that they have Windows 7 drivers. Most reviewers apparently don’t mention this point, perhaps due reader’s to lack of interest in shooting tethered. This was a great and informative review! I really like the depth at which you tested the 7d, and how you compared to the 50d and 5d. All three are great cameras, working well for each individual photographers needs. I would love to see more people doing indepth reviews like this. I’ve read and re-read this review any number of times as I’ve tried to decide what to do about my gear. It’s just great! 6. I have some arthritis and I carry my gear using a Kinesis harness. Weight is an issue for me. Either the 7D or the 60D would add just about a pound to the weight of this gear. Investing a much lesser amount of $ in a micro-four thirds camera and one or two lenses MIGHT solve all problems except my frustration with buffer speed which would, of course, get even worse. I’m willing to put the money in to get the solution to these concerns and I keep thinking that I’m either missing an option to consider or missing some way to think about the options I have available. i have never known you before reading your this review. I am happy to say that , i am owner of a 5D Mk II & i made my purchase without reading a single review of this cam. Today , i am a happy man with the quality of imgaes from my cam. I must inform you that , i am not an expert ,or a pro. At the best , i can be termed as a starter , in the field of photography. I very much liked your review of 7D and i have recommended this cam to many serious photographers. I am happy to know details about 7D through your review. thnks again. I owe you one. http://www.juzaphoto.com/gallery.php?l=it&id=7 mostly taken with the lesser 350D, and you will see what I mean. I love my 5D2. I just wish the fps rate was a wee bit higher but as I use it mainly for landscape, fps isn’t a huge issue. I also have a 1D Mk3 and would love to see how the 7D compares to the 1D3. I quite like the idea of the 1.6 sensor when using either my 100-400 or 300f4 + 1.4 extender. What are your views on replacing the 1D3 with the 7D? The tracking on the 7d is great, coupled with the HS shooting speed you can almost focus 8 times per second, unfortunately you can’t actually focus cleanly and crisply any times per second. The further the subject is from the camera, the worse the focusing. Try shooting a full moon on a 400mm lens at 1/500th of a second, the images are blurred and the moon isn’t exactly racing across the sky. Ok, not everyone likes to photograph the moon, but it’s a great way to test the focus at infinity. Maybe I got a lunchtime special, but in less than 12 months the camera has been send back to Canon 3 times, that’s a total of two months, it still doesn’t focus. It is however ‘within parameters’ as far as Canon are concerned. Focusing obviously isn’t of paramount importance to Canon in an auto-focus camera. I thought that maybe it was my lenses (all of them) so went to a Canon away day and used their brand new 400mm f4 lens mounted on a very solid tripod. No difference, the point where the camera thinks it’s focused is actually not in focus, but an area about 2 feet behind the subject was focused. Great, all I have to do now is focus 2 feet in front of anything I want to shoot, which is a little difficult with wildlife. Maybe it’s me, maybe my old 5d mk1 is faulty and for some reason cancels out my own faults resulting in nice focused images, but somehow I don’t think so. So it’s bye-bye Mr Canon, you screwed me on this occasion but I guarantee you’ll never have the opportunity to do it again. I’m selling up and jumping ship.